If you're looking for a 2-tool kit with a compact drill, grab the Ridgid Gen5X Brushless Kit for a little less than the other guys but with a much more powerful impact driver. What is going on over at the Ridgid labs? I’m pretty sure someone switched out the decaf with espresso considering what their team is producing. We’re used to seeing Ridgid come out with new tools in the general contractor’s kit roughly once a year or so. Nailers? Those are anyone’s guess. 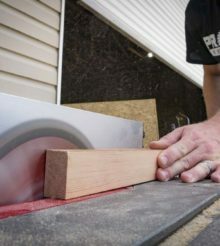 So when we got our hands on the Ridgid Gen5X 5-Tool Kit back in March, we didn’t expect to see much more for a while. Before you know it, we’ve got the Gen5X Random Orbit Sander, Brushless Nailers, and Stealth Force Oil Pulse Driver. Now we have another first from the guys and gals in orange – the Ridgid Gen5X Brushless Compact Hammer Drill and Impact Driver. Clearly, Ridgid Gen5X team members have some serious motivation. What’s more, I’ve heard whispers that a full size heavy duty drill is in the works. Admittedly, those are only rumors, but I like hearing them! Even though it’s compact, the Ridgid Gen5X Brushless Compact Hammer Drill participated in our 18V Heavy Duty Drill Shootout recently. The Ridgid Gen5X Brushless 3-Speed Impact Driver is in the line up for our upcoming 18V Impact Driver Round Up in the coming weeks. Look for it to perform well with best in class torque available. You didn’t come to hear about our editorial calendar, so let’s look at what the Ridgid Gen5X Brushless 2-Tool Kit has to offer! We put Ridgid’s brushless drill through the same 4 tests the rest of the group did in our shootout – drilling 1/4″ holes , driving 3/8″ x 3-1/2″ lag bolts, boring with a 1″ spade bit, and hole cutting with a 3″ hole saw. For complete details of the setup, be sure to check out our 18V Heavy Duty Drill Shootout. Ridgid blew away the field when it came to drilling 1/4″ holes despite the fact it didn’t carry the highest torque. In fact, it had the lowest of the drills we tested (but really high for a compact model). 2100 RPM in high speed left the other participants in the dust. When it came to driving the lag bolts, the compact hammer drill was on the cusp of competing with 3 other drills that each had more than 1000 inch pounds of torque. It was just 1/100 of a second behind Milwaukee’s M-18 Fuel 1200 inch pound beast! Times got a little tougher in the spade bit and hole saw tests with the Gen5X falling behind to 7th out of 8 in both tests. For high speed, low stress applications, the Ridgid Gen5X Compact Hammer Drill is going to outperform models that have a much higher price tag and bigger numbers on their spec sheets. While it’s not surprising the higher stress tasks began to limit the 700 inch pounds of torque, keep in mind that this is lot of torque for a compact model. Most other drills in this class run anywhere from 350 – 600 inch pounds, though a couple of models do exceed the 700 mark. Thanks to the new brushless motor, the drill going to run for a very long time as well. As a compact hammer drill, it’s going to be a high performer that should keep up with anyone else’s model in the same class. In getting ready to put a large group of 18V impact drivers to the test, warming up with Ridgid’s new brushless impact driver gave me the chance to run through the applications early. Sticking with the major uses of impact drivers on the jobsite, going with screw driving and driving lag bolts was a no-brainer. I had to temper back my expectations having played with Ridgid’s Stealth Force Oil Pulse Driver recently both in driving speed and noise. Fortunately, I’d also been working with a couple other impacts helping out Kenny, so I got my feet back on the ground. Driving 3-1/2″ drywall screws into stacked plywood was no problem as I expected. It took an average of just 2.6 seconds. The raw power of this impact driver made it very easy to sink the screws beyond the surface. If you’re looking to drive flush with your work surface, you may want to drop the speed down to 2 and take a little more time to get it done. Before driving the 3/8″ x 3-1/2″ lag bolts, I used Milwaukee’s Titanium Red Helix Shockwave Bits to drill 1/4″ pilot holes. I drilled 20 holes and the impact mechanism didn’t even engage on most of them. There’s a lot of power in this impact driver. Driving the lag bolts was also not much of an issue, averaging 8.3 seconds. Just for kicks, I wanted to see if I could drive a 1/2″ x 5″ lag bolt into the same stacked plywood without a pilot hole. While it was a stressful test (and slow), the Ridgid Gen5X Brushless Impact Driver just kept plugging along without threatening to give up. Did I mention there’s a lot of power in this tool? The Ridgid Gen5X Brushless 2-Tool Kit comes in with an excellent price point of $279. There are others in the ballpark with compact hammer drills, but you won’t find anything near the power packed in the impact driver. Coming in with 2,250 inch pounds of torque is impressive considering I haven’t seen anything else exceed 2,000 yet. I’m a fan of Ridgid’s Hex-Grip overmold in the grip department. Ergonomics in both tools are solid when it comes to grip and balance. They’re not the lightest models on the market, but they’re not cumbersome either. Pros needing a drill for high speed work will find this kit will handle most everything you need. Professionals that do a lot of boring with hole saws or auger bits may want to wait and see if Ridgid announces a heavy duty Gen5X brushless option to supplement the compact model. You can only grab the impact driver as part of the kit at the moment. If you’re looking for a 2-tool kit with a compact drill, grab the Ridgid Gen5X Brushless Kit for a little less than the other guys but with a much more powerful impact driver. Which impact driver(or other tool) does best removing stuck screws without slipping out of the slot? I have this set as well. Finally used the drill with self-feeding auger bit (3/4″) to drill holes to old studs for water lines. Had to restart the drill 10 to 15 times in each stud. It has an auto-shutoff when under too much stress. This is the very reason I bought this set because I thought it would be an incredibly powerful drill. It would be, were it not for the electronic limiter. I think I’m going to have to take this back. I have had this set for a few months now. I use it all the time. I am a millwright by trade and although I don’t work with wood very often, I do work with steel/stainless/and aluminum all the time. This drill performs well with all 3. The impact is a beast. No complaints here. If you use a belt clip, make sure you locktite the screw for the impact driver. Cheers.